Description: Available in 4 3/4", 5 1/2" and 7 1/2" barrel lengths. Made to fit most Single Action revolvers. Original maker - Moran Brothers in Miles City, M.T. This holster dates to 1885. 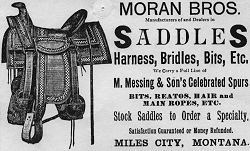 The Moran Brothers opened their first shop in Miles City around 1879. After many successful years, and very high quality work, they finally sold out to C.E. Coggshall in 1895.